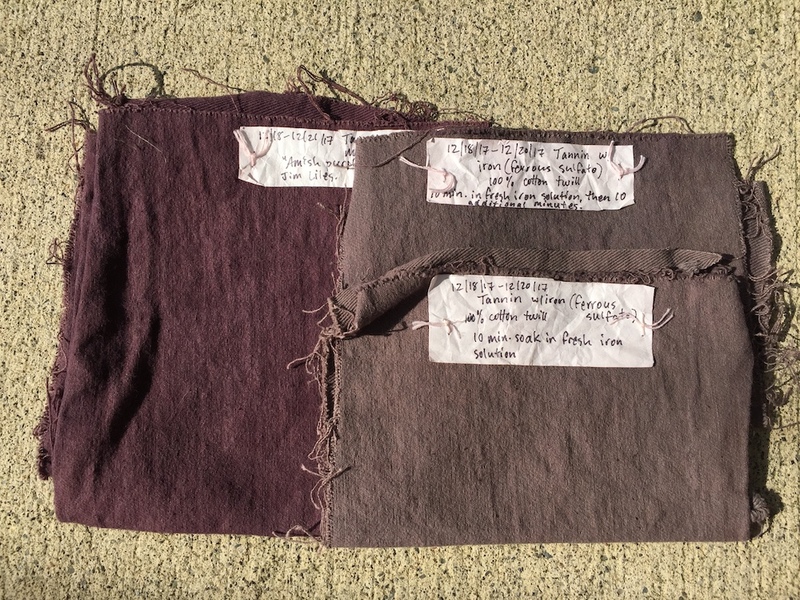 Way back in December, around the time of the winter solstice, I ran some dyeing experiments with heavy cotton twill cloth. I have had some frustrations with cotton over the years, some of which I’ve documented here on this blog. On cotton yarns and cloth, I often get colors that are much lighter than I want, or a different shade than I was expecting. Nevertheless, there are some colors and techniques that have always intrigued me. 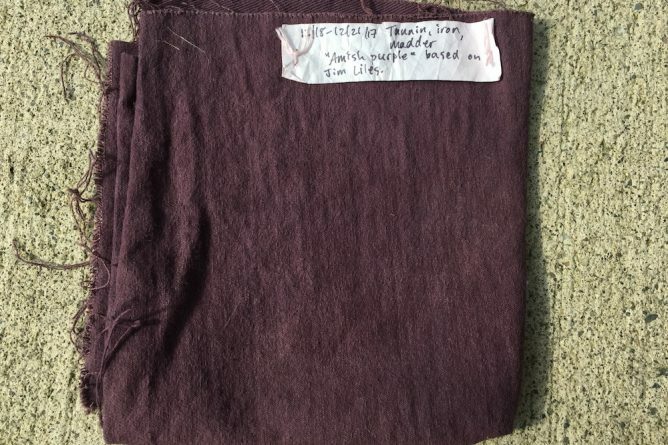 So in December I tried a recipe for “Amish Madder Purple” from Jim Liles’ book The Art and Craft of Natural Dyeing. Cotton, like other plant-derived fibers, is primarily composed of cellulose. Cellulose is harder to dye with natural dyes than protein fibers. Protein fibers come from animals, for example: wool from sheep, mohair from Angora goats, alpaca from alpacas, llama from llamas, and angora from rabbits. Plant fibers can come from a wide range of sources, such as cotton, linen (from flax), hemp, and ramie (from a type of nettle). Most plant-based dyes require a mordant, whether you’re dyeing plant fibers or animal fibers. A mordant is a metallic salt which bonds to the fiber and creates sites for the dye molecules to attach to. It’s like a bridge between the dye and the fiber. Protein fibers are able to bond with plant-based dyes much more easily than cellulose, due to their chemical composition. When you are dyeing cellulose fibers, you need to add some extra steps to the process. 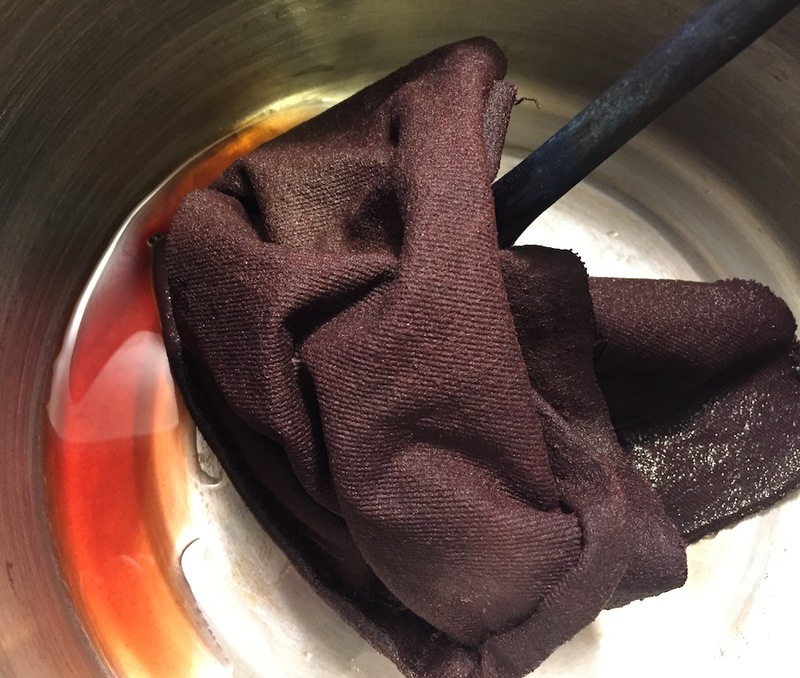 One step that improves the depth and fastness of color on cotton is to use tannin in conjunction with your mordant. The only downside of using tannin is that it can darken the color and make it more brown. There are lots of sources of tannin, some of which produce a light yellow or beige, others a pale pink, and still others dark yellows and browns. This page from Maiwa has some useful information about tannins. But I had found in the past that even with the lightest tannin I had tried (gallotannin from oak galls), I didn’t like the way colors shifted to a muddier tone. 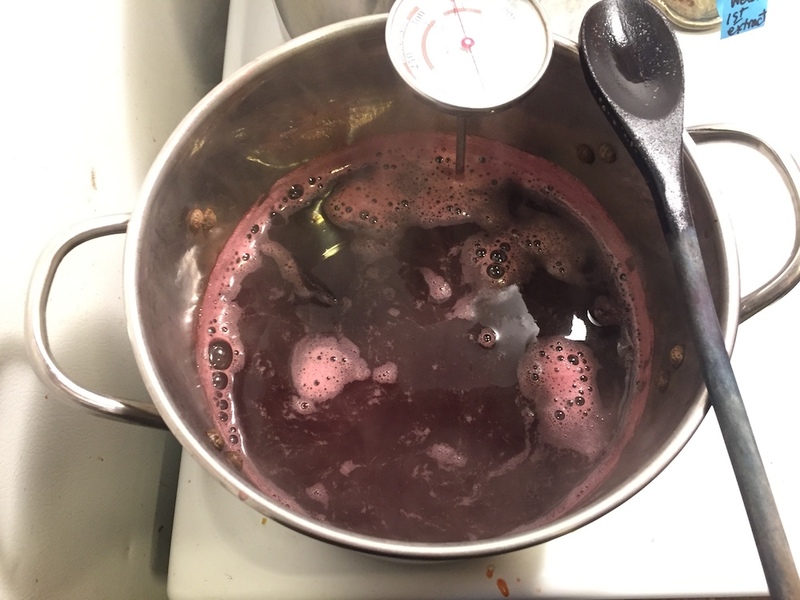 However, for this recipe, the color was supposed to be dark and rich. So, tannin was my friend this time around. In the tub on the left are the samples of cloth that have been scoured in a liquid cationic scour from Earthues (via Nancy Zeller at Long Ridge Farm) along with soda ash. I used scour at a rate of 5.5% of the weight of the goods (the weight of the dry cloth), and soda ash at 2% of the weight of the goods. Following Earthues’ general directions, I dissolved both the scour and the soda ash in a pot of hot water, added the fiber, brought it up to 180 degrees F., then maintained it at that temperature for 30 minutes. I pulled out the cloth while it was still pretty hot and rinsed it well. I should say, too, that the cloth had already been washed in a washing machine with my usual laundry detergent. Well-scoured cotton is key. 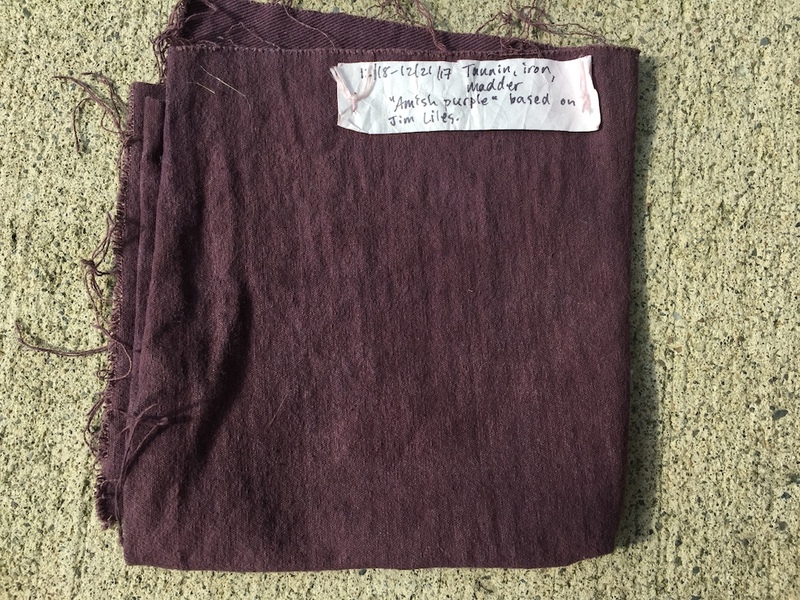 Then the cloth was soaked in a tannin solution overnight (roughly 12 hours). For twelve ounces of fiber I used a little less than 4 oz. of gallotannin from Earthues. After that I let the cloth dry, then cut it into smaller pieces for my experiments. Each little sample was about 1.5 oz. On the right hand side of the photo above, you can see the dramatic shift in color when the tannin-treated fiber was submerged in a solution of ferrous sulfate (iron) for 30 minutes. For the small samples I was doing, I used a quarter of a teaspoon of iron dissolved in a stainless steel pot with 2 gallons of hot water. Iron can make blotches, so I “worked” the fiber, meaning I picked it up and moved it around under the water. Wear gloves! This is an important safety rule when working with mordants. The color shifted noticeably after only ten minutes! I have to say, it was really exciting! The last step in this “Amish Purple” recipe is the madder dyebath. A while ago I bought powdered madder root on sale from Dharma Trading. It is a little tricky to work with because it is very fine and hard to strain, but the price was right. 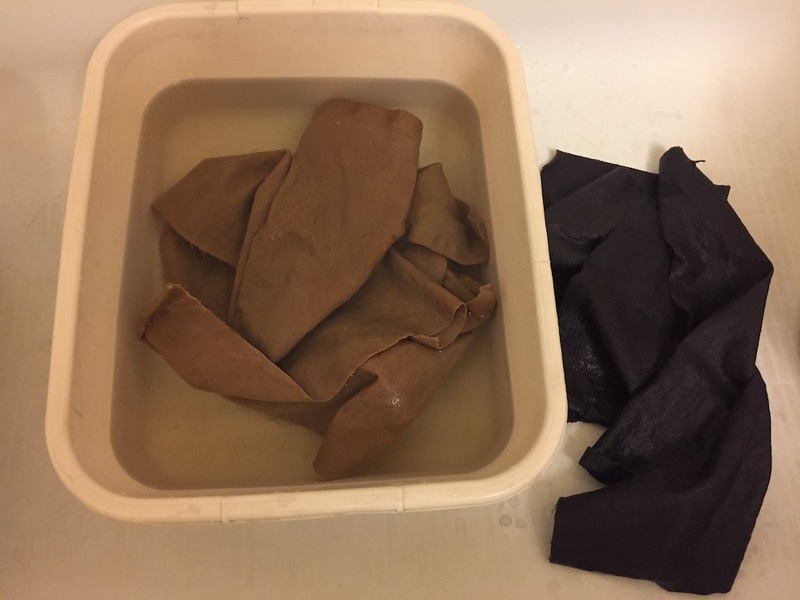 I used about a 1:1 ratio of plant material to fiber, extracted the madder twice over two days, then combined the two dyebaths. I kept the temperature on the madder bath around 130 degrees F while it was heating. Once the madder bath was strained, I divided the dyebath in half. In one half, I put one of the little samples into the dyebath overnight just to soak. In the morning I pulled it out, stirred in a quarter of a teaspoon of dissolved calcium carbonate, returned the cloth to the pot, and heated it. The pH was 7. 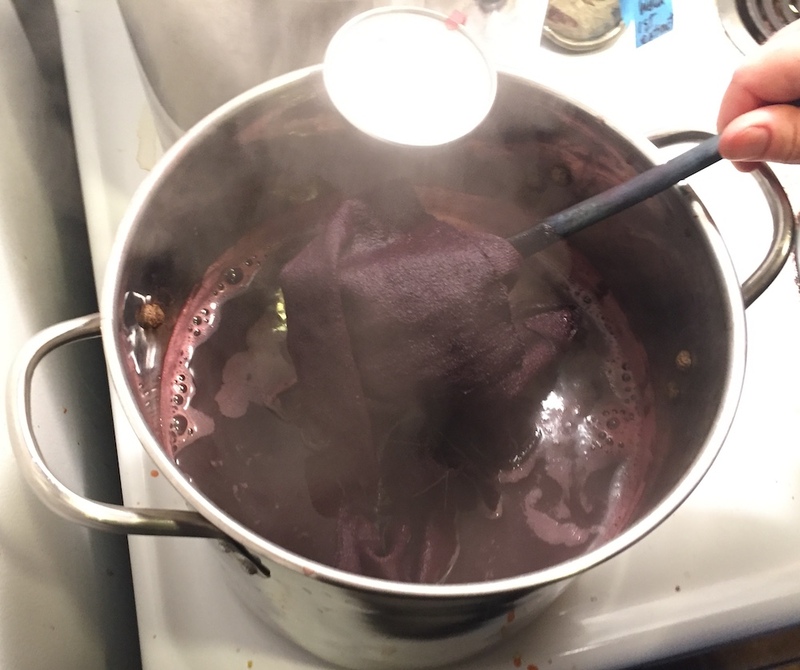 While dyeing the cloth, I let the bath get up to 160 degrees and maintained that temperature for an hour. I really like the rich eggplant-purple in the madder sample. I expected the tannin-iron samples to be more of a charcoal gray, but they have a purplish tint as you can see here. Clearly, tannin on cotton is way more exciting than I previously gave it credit for!